Having completed an Exposition of the whole Bible; I considered with myself what would be best next to engage in for the further instruction of the people under my care; and my thoughts led me to enter upon a Scheme of Doctrinal and Practical Divinity. 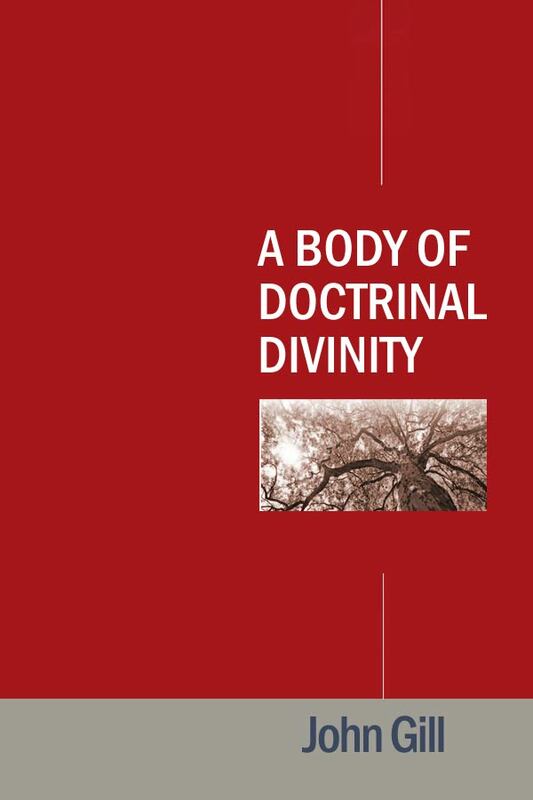 Doctrine has an influence upon practice, especially evangelical doctrine, spiritually understood, affectionately embraced, and powerfully and feelingly experienced. Where there is not the doctrine of faith, the obedience of faith cannot be expected. John Gill (23 November 1697 – 14 October 1771) was an English Baptist, biblical scholar, "Jehovist", and held to a staunch Calvinistic Soteriology. Born in Kettering, Northamptonshire, he attended Kettering Grammar School where he mastered the Latin classics and learned Greek by age 11. He continued self-study in everything from logic to Hebrew, his love for the latter remaining throughout his life. BOOK I: Of God, His Words, Names, Nature, Perfections, and Persons. 3. Of the Names of God. 4. Of the Nature of God. 5. Of the Attributes of God in General and of His Immutability in Particular. 6. Of the Infinity of God, His Omnipresence and Eternity. 7. Of the Life of God. 8. Of the Omnipotence of God. 9. Of the Omniscience of God. 10. Of the Wisdom of God. 11. Of the Will of God, and the Sovereignty of It. 12. Of the Love of God. 13. Of the Grace of God. 14. Of the Mercy of God. 15. Of the Long-Suffering of God. 16. Of the Goodness of God. 17. Of the Anger and Wrath of God. 18. Of the Hatred of God. 19. Of the Joy of God. 20. Of the Holiness of God. 21. Of the Justice or Righteousness of God. 22. Of the Veracity of God. 23. Of the Faithfulness of God. 24. Of the Sufficiency and Perfection of God. 25. Of the Blessedness of God. 26. Of the Unity of God. 27. Of a Plurality on the Godhead; or, A Trinity of Persons in the Unity of the Divine Essence. 28. Of the Personal Relations; or, Relative Properties Which Distinguish the Three Divine Persons in the Deity. 29. Of the Distinct Personality, and Deity of the Father. 30. Of the Distinct Personality, and Deity of the Son. 31. Of the Distinct Personality, and Deity of the Holy Spirit. BOOK II: Of the Acts and Works of God. 1. Of the Internal Acts and Works of God; and of His Decrees in General. 2. Of the Special Decrees of God, Relating to Rational Creatures, Angels, and Men; and Particularly of Election. 3. Of the Decrees of Rejection, of Some Angels, and of Some Men. 4. Of the Eternal Union of the Elect of God Unto Him. 5. Of Other Eternal and Immanent Acts in God, Particularly Adoption and Justification. 6. Of the Everlasting Council Between the Three Divine Persons, Concerning the Salvation of Men. 7. Of the Everlasting Covenant of Grace, Between the Father, and the Son, and the Holy Spirit. 8. Of the Part Which the Father Takes in the Covenant. 9. Of the Part the Son of God, the Second Person, Has Taken in the Covenant. 10. Of Christ, as the Covenant-Head of the Elect. 11. Of Christ, the Mediator of the Covenant. 12. Of Christ, the Surety of the Covenant. 14. Of the Concern the Spirit of God Has in the Covenant of Grace. 15. Of the Properties of the Covenant of Grace. BOOK III: Of the Eternal Works of God. 1. Of Creation in General. 3. Of the Creation of Man. 4. Of the Providence of God. 5. Of the Confirmation of the Elect Angels, and the Fall of the Non-Elect. 6. Of the Honour and Happiness of Man in a State of Innocence. 8. Of the Sin and Fall of our First Parents. 9. Of the Nature, Aggravations, and Sad Effects of the Sin of Man. 10. Of the Imputation of Adam's Sin to all His Posterity. 11. Of the Corruption of Human Nature. 12. Of Actual Sins and Transgressions. 13. Of the Punishment of Sin. BOOK IV: Of the Acts of the Grace of God, Towards, and Upon His Elect in Time. 1. Of the Manifestation and Administration of the Covenant of Grace. 2. Of the Exhibitions of the Covenant of Grace in the Patriarchal State. 3. Of the Exhibition of the Covenant of Grace Under the Mosaic Dispensation. 4. Of the Covenant of Grace, as Exhibited in the Times of David, and the Succeeding Prophets, to the Coming of Christ. 5. Of the Abrogation of the Old Covenant, or First Administration of it, and the Introduction of the New, or Second Administration of it. 6. Of the Law of God. BOOK V: Of the Grace of Christ in His States of Humiliation and Exaltation, and in the Offices Exercised by Him in Them. 1. Of the Incarnation of Christ. 2. Of Christ's State of Humiliation. 3. Of the Active Obedience of Christ in His State of Humiliation. 4. Of the Passive Obedience of Christ, or of His Sufferings and Death. 5. Of the Burial of Christ. 6. Of the Resurrection of Christ from the Dead. 7. Of the Ascension of Christ to Heaven. 8. Of the Session of Christ at the Right-Hand of God. 9. Of the Prophetic Office of Christ. 10. Of the Priestly Office of Christ. 11. Of the Intercession of Christ. 12. Of Christ's Blessing His People as a Priest. 14. Of the Spiritual Reign of Christ. BOOK VI: Of the Blessings of Grace, and the Doctrines of It. 2. Of the Causes of Redemption by Christ. 3. Of the Objects of Redemption by Christ. 4. Of those Text of Scripture Which Seem to Favour Universal Redemption. 6. Of Propitiation, Atonement, and Reconciliation, as Ascribed to Christ. 7. Of the Pardon of Sin. 10. Of the Liberty of the Sons of God. 15. Of the Perseverance of the Saints. BOOK VII: Of the Final State of Man. 1. Of the Death of the Body. 2. Of the Immortality of the Soul. 3. Of the Separate State of the Soul Until the Resurrection, and Its Employment in that State. 4. Of the Resurrection of the Body. 5. Of the Second Coming of Christ, and His Personal Appearance. 6. Of the Conflagration of the Universe. 8. Of the Millennium, or Personal Reign of Christ with the Saints on the New Earth a Thousand Years. 9. Of the Last and General Judgment. 10. Of the Final State of the Wicked in Hell. 11. Of the Final State of the Saints in Heaven.